It is with deep sadness that we announce the passing of our beloved mom and grandma (mama) Olga Stewart. Olga passed away peacefully August 20, 2018 at Talarico Place at the age of 89. Olga was born to Walter and Pearl Glowaski on March 25, 1929 in Mundare, Alberta. Olga spent her youth in Big River, Saskatchewan before moving to Banff, Alberta to work at the Banff Springs Hotel. She also spent part of her younger years working in Port Alberni before marrying and settling in the Kootenays. Olga married William Stewart on May 17, 1957 and resided in Salmo, BC until moving to Nelson in 1969. Olga enjoyed many years of curling and attended numerous bonspiels in the area. She was also an avid gardener. Olga was a lifetime member of the Order of the Royal Purple and a volunteer for several years at the I.O.D.E. thrift store. She was predeceased by her husband William (Bill) Stewart in 2008. She is survived by her three children, son Grant (Cindy) Stewart, grandchildren Alexander and Richelle of Campbell River, BC, son Keith Stewart of Edmonton, AB, and her daughter Shari (Rick) Donaldson and granddaughters Kristen, Kaitlyn, and Courtney of Nelson, BC and her niece Carol Comtois of Blueberry, BC. A special thanks to Dr. Woodward, the third-floor nursing staff at Kootenay Lake Hospital, Lakeview Village and the caregivers at Talarico Place for their wonderful support and care. In lieu of flowers donations can be made in Olga’s name to the Kootenay Lake Hospital Foundation. There will be no service by Olga’s request; the family will be having a private gathering. 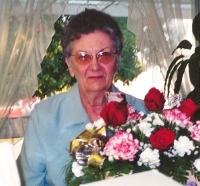 Cremation has taken place and Olga will be placed to rest at the Mausoleum in the Nelson Cemetery. Always loved, never forgotten, forever missed. A special thanks to Dr. Woodward, the third-floor nurseing staff at Kootenay Lake Hospital, Lakeview Village and the caregivers at Talarico Place for their wonderful support and care.